Adult Appearance: Overall black plumage with white primary feathers on the wings. Bill black with a large casque on top, near the base. Bright-red exposed skin on the throat extends onto the face and surrounds the eye. Females often with a violet-blue patch on the throat and neck or spots on the facial skin (does not ring the eye as with Northern Ground Hornbills). Range: Southern Africa from Kenya through the Eastern Cape in South Africa. Sympatric with the Northern Ground Hornbill in southern Kenya. Habitat: Woodland and savanna habitat from sea level to c.3,000 m (9,843 ft). Population in Wild: Global population not quantified. In South Africa, 1,500-2,000 individuals; range shrinking within the country and numbers on the decline. Locomotion: Walk and run on the ground; rarely hop. Strong, heavy flight; wing beats deep. Capable of carrying large food masses in the bill when in flight. Activity Cycle: Active in daylight and roost in trees at night. Typically become active near dawn when group members produce deep, booming territorial calls before heading off to forage. Social Groups: Live in family groups consisting of a dominant adult male and female pair and their offspring. Dominant pair are the sole individuals to reproduce. Lone individuals are most often females. Diet: Generalists. Birds consume a variety of animals, eating any animal that can be overcome. Reptiles, amphibians, snails, and insects are commonly taken. Rarely consume carrion. Predators: Leopards and Martial Eagle prey on all ages. Chick-specific predators include genet and snakes. Sexual Maturity: Males and females first reproduce c. 4-6 years of age. Incubation: Dominant female sits on eggs for c.40 days. Incubation begins immediately after the first egg is laid. Clutch Size: 1-3 eggs; a 3-5 day interval separates laying of each egg. Interclutch Interval: May not breed annually. Longevity: Long lived. Maximum longevity >54 years in managed care. Typically survive c. 28 years in the wild, though possibly 35-40 years. Some cultures in Africa believe the birds are keepers of time and interpret the bird's characteristic call signals a change in season. ​This call, a four-note "hoo hoo hoo hoo", is actually a means for family units to advertise territory. ​The sounds produced may carry up to 4.5 km (2.8 mi). ​A group (family unit) consists of a dominant adult male and female pair and their offspring. Only the dominant (monogamous) pair breeds, but all members aid in providing food for the mother and chicks. Dietary items most commonly include reptiles, amphibians, snails, and insects. © 2015 San Diego Zoo Global. Updated April 2015. 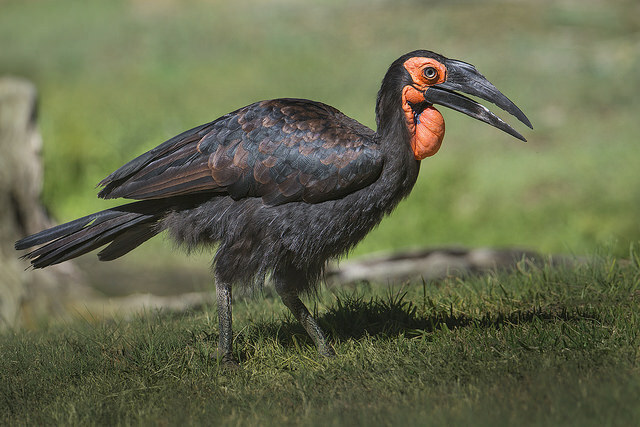 How to cite: Southern Ground Hornbill (Bucorvus leadbeateri) Fact Sheet. c2015. San Diego (CA): San Diego Zoo Global; [accessed YYYY Mmm dd]. http://ielc.libguides.com/sdzg/factsheets/ southern_groundhornbill. Many thanks to Ann Knutson for providing content review for this fact sheet. Ann has eight years of experience working with birds in managed care and currently serves as a Senior Keeper with the San Diego Zoo's Avian Propagation Center and is the AZA SSP and Studbook Keeper for the Southern Ground Hornbill. Prior to this she worked with Sedgwick County Zoo (Wichita, KS) and conducted bird banding with the Institute of Bird Populations in Texas.